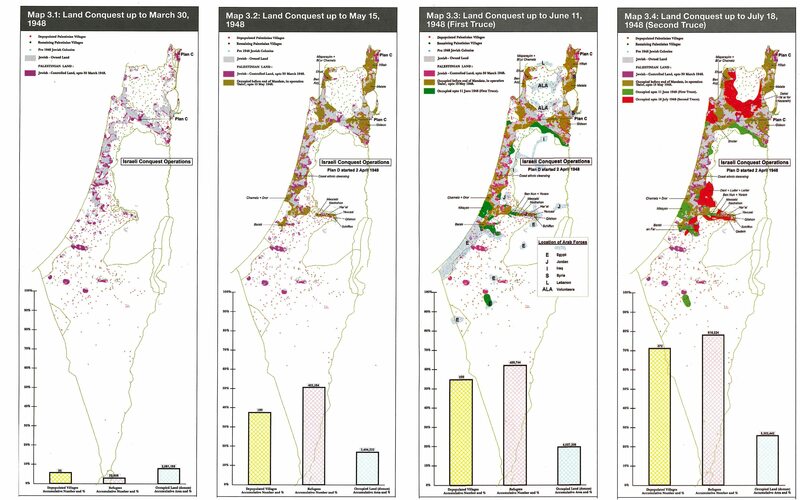 Nakba detailed maps including Refugees statistics. What lessons have the revisionist historians drawn from their diligent working-through of the archives? As regards the broad picture of the balance of power between Jews and Arabs in both 1947 and 1948, their results contradict the generally-held picture of a weak and poorly armed Jewish community in Palestine threatened with extermination by a highly armed and united Arab world – David versus Goliath. Quite the contrary. The revisionists concur in pointing to the many advantages enjoyed by the nascent Jewish state over its enemies: the decomposition of Palestinian society; the divisions in the Arab world and the inferiority of their armed forces (in terms of numbers, training and weaponry, and hence impact); the strategic advantage enjoyed by Israel as a result of its agreement with King Abdullah of Transjordan (in exchange for the West Bank, he undertook not to attack the territory allocated to Israel by the UN); British support for this compromise, together with the joint support of the United States and the Soviet Union; the sympathy of world public opinion and so forth. This all helps to explain the devastating effectiveness of the Jewish offensives of spring 1948. It also sheds new light on the context in which the mass departure of Palestinians took place. The exodus was divided into two broadly equal waves: one before and one after the decisive turning-point of the declaration of the State of Israel on 14 May 1948 and the intervention of the armies of the neighbouring Arab states on the following day. 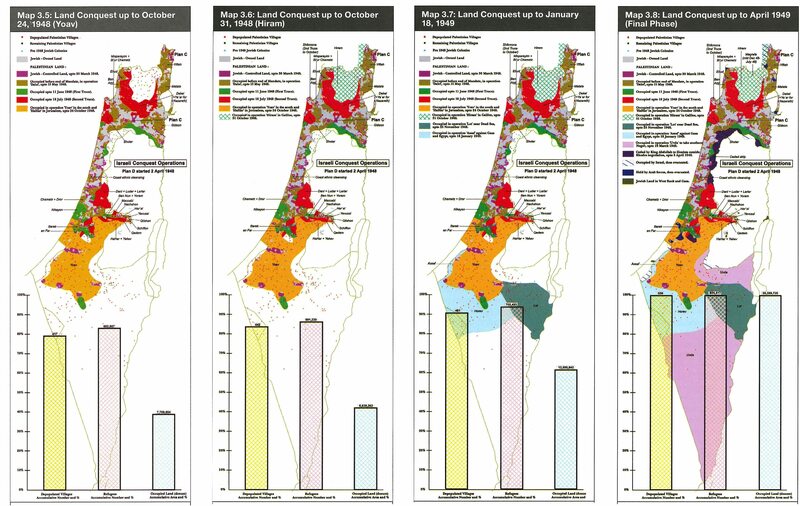 One can agree that the flight of thousands of well-to-do Palestinians during the first few weeks following the adoption of the UN partition plan – particularly from Haifa and Jaffa – was essentially voluntary. The question is what was the truth of the departures that happened subsequently? In the opening pages of “The Birth of the Palestinian Refugee Problem”, Benny Morris offers the outlines of an overall answer: using a map that shows the 369 Arab towns and villages in Israel (within its 1949 borders), he lists, area by area, the reasons for the departure of the local population (9). In 45 cases he admits that he does not know. The inhabitants of the other 228 localities left under attack by Jewish troops, and in 41 cases they were expelled by military force. In 90 other localities, the Palestinians were in a state of panic following the fall of a neighbouring town or village, or for fear of an enemy attack, or because of rumours circulated by the Jewish army – particularly after the 9 April 1948 massacre of 250 inhabitants of Deir Yassin, where the news of the killings swept the country like wildfire. By contrast, he found only six cases of departures at the instigation of local Arab authorities. “There is no evidence to show that the Arab states and the AHC wanted a mass exodus or issued blanket orders or appeals to the Palestinians to flee their homes (though in certain areas the inhabitants of specific villages were ordered by Arab commanders or the AHC to leave, mainly for strategic reasons).” (“The Birth of the Palestinian Refugee Problem”, p. 129). On the contrary, anyone who fled was actually threatened with “severe punishment”. As for the broadcasts by Arab radio stations allegedly calling on people to flee, a detailed listening to recordings of their programmes of that period shows that the claims were invented for pure propaganda. (9) “The Birth of the Palestinian Refugee Problem”, Benny Morris, pp. 14-18. A careful comparison of the text of the book with the tables showing village by village the principal reasons for the exodus reveals a clear – and surprising – underestimation in the tables of the extent of actual expulsions. Posted on 2016/06/17 by QCPal	Bookmark the permalink.